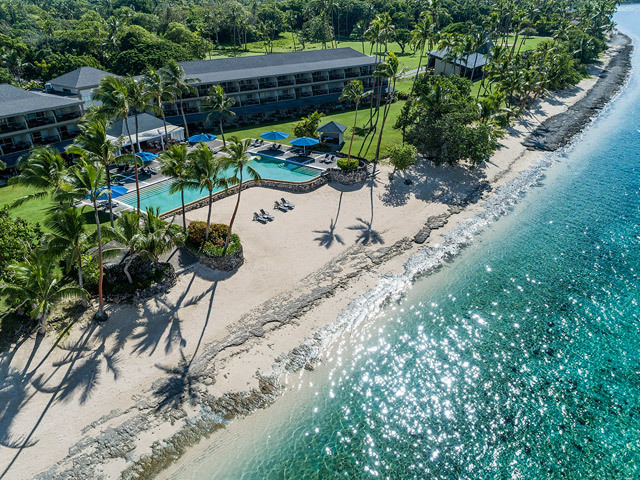 The Shangri-La Fijian Resort & Spa, located on Fiji's Coral Coast has recently unveiled its contemporary US$50 million refurbishment, with an upgrade made to it luxurious CHI Spa. CHI, The Spa is the only spa in Fiji that offers an overnight spa package. The Dusk Till Dawn package involves an overnight treatment and stay in the Resort. Drawing from local inspiration, a place of personal peace, enchantment and wellbeing, all massages and treatments are based on authentic natural healing methods found in traditional wellbeing practices shared by many Asian cultures. Nestled in Shangri-La's Fijian Resort & Spa, the Ocean Bures spa suite overlooks the clear waters and is one of the largest spa suites in Fiji. Completely outfitted with king size bed, private balcony, bathroom with outdoor bath and steam as well as your own spa treatment room, "Dusk till Dawn" is a complete spa and sleep experience. After checking in to the suite, guests are drawn a private outdoor bath served with a platter of fresh seasonal fruit. Followed by a relaxing steam, a full body scrub and 60 minute tension-releasing body massage. In the evening, a light, spa cuisine meal is served in the suite and then guests are left to relax until the morning. The following morning guests receive a breakfast on the private balcony and before checking out they will be treated to a facial. CHI uses products by Zents as well as Pure Fiji products which contain the natural Fijian botanicals. Shangri-La's Fijian Resort & Spa is spread across more than 100 hectares of private island, connected by a causeway to the mainland, providing a Fijian island experience with ease of access to the Coral Coast. An exclusive adults-only precinct, world-class restaurants and accommodation makeover are signature elements of the USD50 million revitalisation of the largest private island resort in Fiji and the South Pacific, Shangri-La Fijian Resort & Spa.